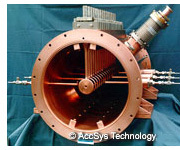 Custom Linacs manufacturing | AccSys Technology, Inc.
AccSys' PL-Series high-current pulsed proton linacs provide a wide range of peak and average currents at energies from 2 MeV to above 100 MeV. The unique ability to vary pulse width, energy and current from pulse to pulse allows one accelerator to simultaneously provide tailored beams for multiple targets or user applications. These high power systems are suitable for applications that range from synchrotron injection and research to isotope production. This linac technology can also be sued to provide acceleration of ions heavier than hydrogen and deuterium. AccSys would be pleased to design a custom linac system for your particular application. AccSys' proprietary and patented linac technology can provide a wide range of ion beams and energies for specialized applications in research and industry. AccSys experts will design a system to customer specifications consisting of a carefully selected combination of our standard modular subsystems: radiofrequency quadrupole (RFQ) linacs, drift tube linacs (DTL), rf power systems and/or other components such as high energy beam transport (HEBT) systems and buncher cavities. AccSys' patented Univane (US Patent No. 5,315,120) design provides a robust, cost-effective solution for low-velocity ion beams. This unique geometry incorporates four captured rf seals, is easy to machine, assemble and tune, and is inexpensive to fabricate. The extruded structure, which is available in lengths up to three meters, can accelerate ions injected at 20 to 50 keV up to 4 MeV per nucleon. Cooling passages in the structure permit operation at duty factors up to 25%. 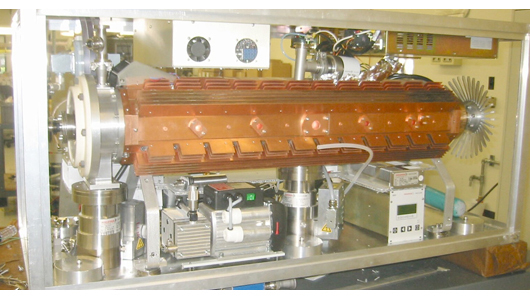 Drift Tube Linacs provide a cost-effective solution for ion beam energies above a few MeV per nucleon. Designed to accelerate ions from an RFQ, the DTL's permanent magnet focusing and high rf efficiency result in a minimum cost per MV. AccSys' patented drift tube mounting scheme (US Patent No. 5,179,350), which is integral to the twin-beam welded vacuum tank, provides excellent mechanical stability and low beam loss. AccSys' high peak power UHF rf power systems (150 to 600 MHz) are ideal for use with cavity accelerators and other resonant loads. Based on parallel planar triode arrays, these systems are smaller, less expensive and easier to operate and maintain than other types of rf amplifiers. Load-breakdown, high VSWR and fast load changes are handled by protection circuitry. Isolators are not required in most applications. Systems are available with peak powers from 25 to 360 kW and duty factors up to 2.5%.